Eduardo: "You left the army for this city?" Jim: "It grows on you." How right Jim is here. And while 'Pena Dura' is actually a pretty outstanding follow-up to last week's episode, it also bears a disheartening feature often found in Michael Crichton novels; it builds up some thrilling concepts for the first two-thirds, but the actual executions of said concepts in the last third are quite lackluster. 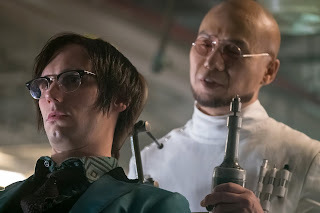 Quite surprisingly, I expected Gotham to drag out Gordon learning that Nygma was the one behind Haven's detonation by at least one more episode, but in fact, the pace doesn't drag too much after Eduardo steps in, and he and Gordon learn from the RPG dealer's logbook that Nygma was his most recent client. Gordon and Delta Force try to arrest Nygma at his safehouse, but Nygma is able to make his getaway by activating an IED below Eduardo's feet that will go off if Nygma is shot down. I must confess that this scene alone gave Nygma the essence of The Riddler more so than anything Season 4 did for his character. He's got his massive ego back, he's rigged his safehouse with booby traps, and of course, it takes the solving of a riddle too to deactivate the IED. As Gordon appropriately puts it – "there's always a puzzle with Nygma." It's becoming a bit muddled though as to who exactly is in control of Nygma's body now. At the beginning of Season 5, it seemed that it was the Riddler trying to retrace his steps and learn what Ed has been doing during the blackouts, but in 'Pena Dura', the geeky CSI Ed is now the one the focus is on. What's more, Gotham seems to be doing a bit of retooling to the Ed personality as well; he's suddenly aghast to learn he was behind the bombing of Haven and the deaths of hundreds of civilians, yet he had no issue with making a name for himself as a feared criminal mastermind back in Season 3 by mercilessly stabbing a stage performer. With Nygma on the run, Gordon puts the word out around the city that Nygma's the most likely culprit behind the attack on Haven. As a result, it isn't long before Nygma is captured and bound by a group of stereotypes, evidently intent on avenging their dog that was killed in the attack, and tortured through electroshock administration. In the process, buried memories start rising to Nygma's conscious, most prominently, a vision of Oswald promising to 'fix' Nygma. Believing Oswald to be the one behind his constant blackouts, Nygma engineers another escape and confronts Oswald, in a much-anticipated reunion for many of the show's viewers. Regardless of whether or not there's meant to be some sexual undertones in the conversations between these two, there's no denying that their bickering and their scene-chewing is always a welcome highlight. I got a kick out of how Oswald basically admitted too that only because he shot Butch last year did Nygma by default fill the slot of being his 'best friend'. I've also grown fond of the increasing competitiveness between these two over the last year. I don't think they'll ever be able to return to the relationship they once held back in the beginning of Season 3, but they at least now retain a mutual respect for the other. They'd never go out of their way to kill the other, but they also definitely would not hesitate now to throw them under the bus if it meant saving their own skin, as Oswald does moments later when Delta Force shows up on his doorstep. 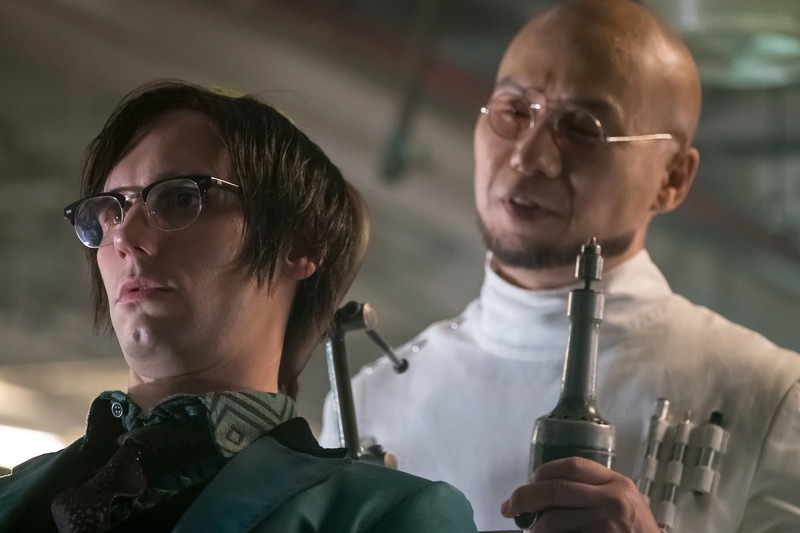 Oswald tells Gordon that Nygma's going after Hugo Strange next, since Strange was the one Oswald ordered to 'fix' Nygma. I also haven't forgotten that Oswald also asked Strange to 'fix' Lee Thompkins, but the show seems to have, so let's move on. Strange, greeting Nygma with an impeccable George Takei imitation, admits he is also unaware that Nygma has been blacking out, but confesses to having installed some sort of microchip that is subject to remote control in Nygma's head while he was in the process of being resurrected. Yet Strange oddly enough is also not the one who has been controlling Nygma. In a twist of events that now makes the twists of How I Met Your Mother's finale look rather superb, it turns out Delta Force and their shadowy government-affiliated leader Walker have been controlling Nygma the entire time. But here's the darnedest thing – the eyeroll and exhale this reveal got out of me wasn't a result of the twist being obvious – it's just that I feel Gotham has earned its place as being a series that should have shelved plot points like this. If Gotham remained in the confines of the grounded cop drama it was attempting to be way back in Season 1, then a reveal like this would have felt more accommodated to the show's nature. But Gotham is well past that point, what with their featuring of laughing gas, serial killers with pig masks, shapeshifters and countless resurrections, I know it can do more than just the evil-government-conspiracy that wants to clean house shtick. Meanwhile, at the Sirens' club, Selina is being celebrated for killing the clearly not-dead Jeremiah Valeska. Funny how Bruce and Selina are always attempting to alleviate the other in Barbara's club, and this felt like a nice parallel to their encounter back in Season 4's 'Pieces of a Broken Mirror'. As much as Bruce wants though to convince Selina she's not a cold-blooded killer, Selina's only form of rebuttal is by trying to – once again, no less – demonstrate to Bruce that she doesn't give a hoot about anyone else except herself. This blather doesn't strike me as genuine though, as much as it more feels like Selina's just trying to save face. I also trust in Bruce to know Selina well enough to see through her jibber-jabber. Jeremiah himself turns out to have survived Selina's stabbings through the use of some nifty body armor. As commonplace as that solution does sound, we finally get a laugh out of Jeremiah by the episode's end. Something else I haven't seen others comment on is how it sounds almost as if Cameron Monaghan is evolving his Jeremiah voice with every episode. By now, he's done a phenomenal job at distinguishing his performance as Jeremiah in every aspect from his performance as Jerome. 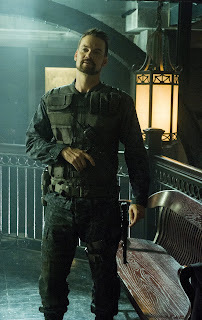 To capitalize on my earlier metaphor, 'Pena Dura' has a first-rate setup that's unfortunately dampened in the end by its anti-climatic resolutions – our big baddie for the final season looks to be our own government, Nygma's been reduced essentially to a murder-bot hitman, and Jeremiah survives a stab wound to the chest (he even mentions that one Selina's attacks missed the armor) merely because the story needs him to. Not to mention that the cat-and-mouse game of pursuing Nygma and Strange could have been trimmed down by ten minutes. • I don't consider myself much of a dog person, but if something ever happens to Oswald's bulldog, Gotham's showrunners will be receiving a vent-heavy letter penned by yours truly. • I thought I heard Eduardo misspeak at first, and refer to Walker as 'Waller', leading me to suspect that Gotham was actually in the midst of introducing to us Amanda Waller and conceiving their own lineup of the Suicide Squad. Not really a dog person either, but don't hurt the dog, show. Well Jeremiah wasn't dead. What a shock. Guess Lee's not showing up then? Was Moreena shooting Deadpool 2 or somthing? Gotta love an Ed/Ozzie moment, and this was great.